Michael Royson sent these 2 lovely pictures of the Marcos Factory in Bradford upon Avon. The pictures are dated April 1964 and were discovered by Per Hagermark many years ago at The National Motor Museum in Beaulieu. These kind of pictures are great to investigate. 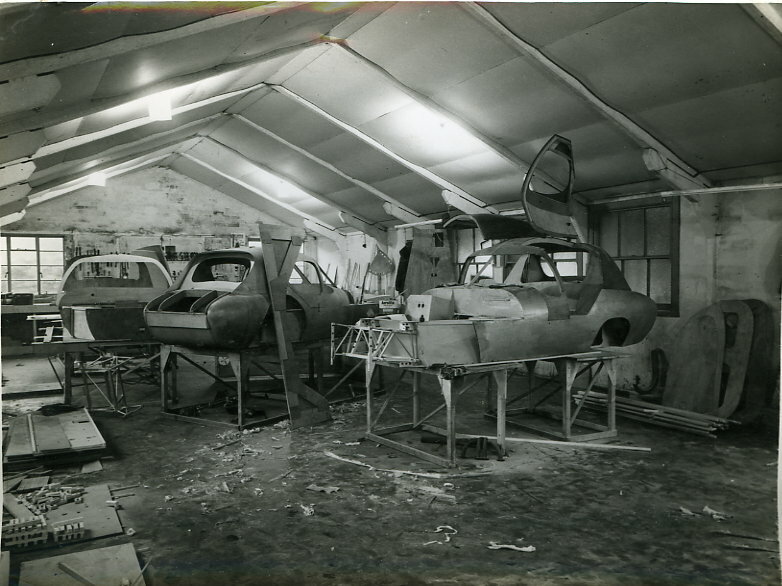 On the pictures we see two Marcos 1800’s, but as production has only started a couple of months earlier, there is a good deal of Fastbacks and Gullwings around. The light grey Gullwing is the ex-Stephen Miniprio car, by that time owned by Tim Lalonde, who raced on a regular basis for the works. The dark blue fastback on the picture left is likely to be the car Tim Lalonde drove for the works, although it probably did not get that dirty on the track and does not sport any racing roundels! The other dark (blue?) 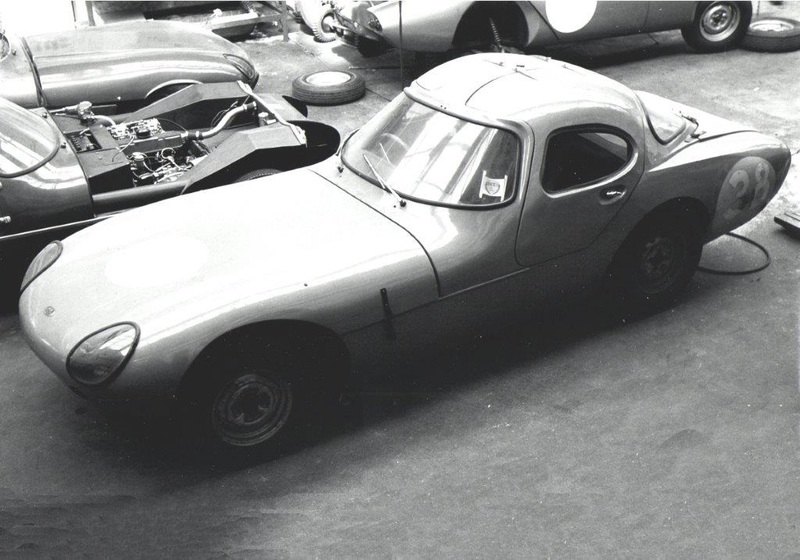 fastback, also with the bonnet open, standing next to the Lalonde gullwing, is not the other works racer (850CAM). That had a shortened passenger footwell to give the carburettors more clearance and this car has not. 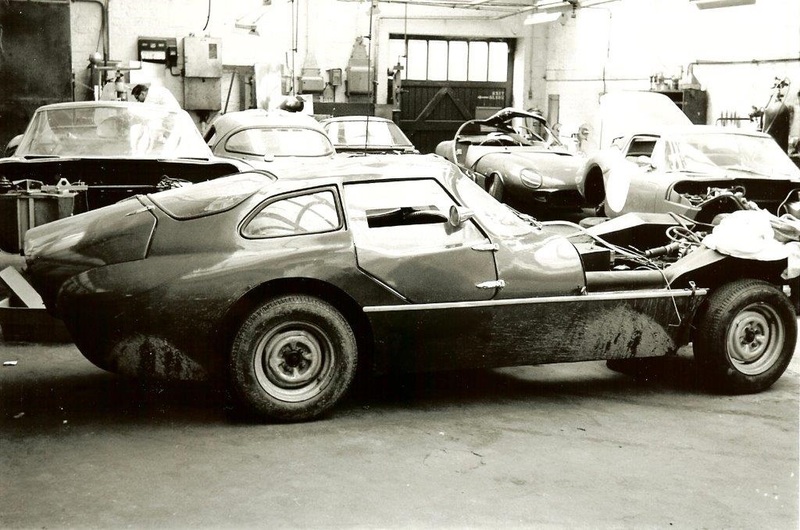 Could this be a customers car, or would it be 189BER, the ex prototype which was owned and raced (amonth others) by Terry Sanger around that time? Jem Marsh was about to race a white fastback registered 151FYV, could there be any link with any of these fastbacks on the picture? But most intriguing is the Gullwing in the corner. It’s roof is severely damaged and the car sports a Fastback bonnet. Would they have rebuild that car as a Gullwing or as the newer Fastback? Or could it be the Gullwing 395 BBL, which was discovered when it was fitted with a Fastback bonnet? Rebuilding a Gullwing with tie and cigarette! 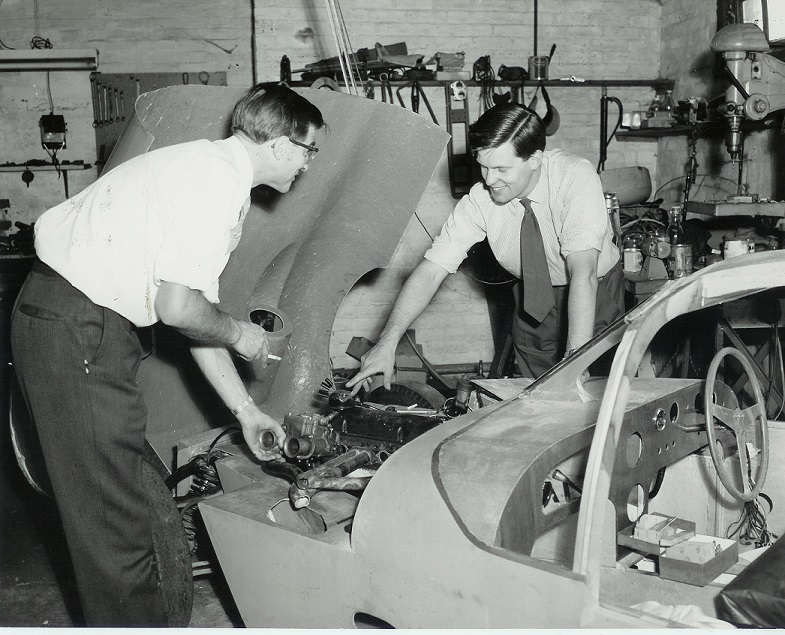 John Cotton (on the left) and John Sutton pose with John Sutton’s car after most of its rebuild has been done. John Sutton recollects: ‘The photo is from late 1962 when we were finishing off the rebuild of 80 SNK. It was a publicity photo for an article in the Vauxhall Mirror. John Cotton designed the Vauxhall slant engine which went into production in 1963. A super shot of the last Ugly Ducklings (by now the design smoothened by Dennis Adams) being produced. As far as we know two were actually finished and raced, the third (and fourth) chassis being used as basis for later Luton Gullwings.